Mixed results for other Nikkei candidates in Bay Area. • Emily Murase, vice president of the San Francisco Board of Education, was re-elected, finishing in first place out of nine candidates for three seats. Murase had 61,289 votes (18.83 percent), followed by Shamann Walton, executive director of Young Community Developers, with 52,175 (16.03 percent) and incumbent Hydra Mendoza with 39,628 (12.18 percent). Also running were Trevor McNeil, Stevon Cook, Dennis Yang, Lee Hsu, Jamie Rafaela Wolfe and Mark Murphy. Murase was first elected in 2010, becoming the first Japanese American to serve on the board. The mother of two daughters, one attending Lowell High School and the other Presidio Middle School, she says her “ABC Agenda” consists of academic achievement, bullying prevention/intervention, and college- and career-ready graduates. She is also executive director of the San Francisco Department on the Status of Women. First elected in 2006, Mendoza is the first Filipina elected to public office in San Francisco. She is also the mayor’s education advisor. 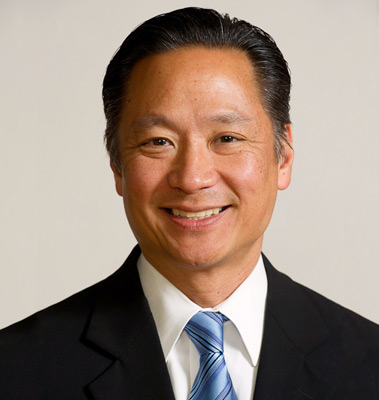 • San Francisco Public Defender Jeff Adachi ran unopposed for re-election and received 113,707 votes (98.26 percent). Previously deputy public defender and chief attorney of the Public Defender’s Office, Adachi ran against incumbent Kimiko Burton and was elected head of the office in 2002, and was re-elected with no opposition in 2006 and 2010. In a message to voters prior to the election, Adachi said, “I have been honored to serve as your city’s public defender for the past 12 years. Each year, the office and its staff helps over 20,000 San Franciscans obtain justice in the courts, and enforce our nation’s Bill of Rights and Constitution. I have also worked to improve the quality of life for all San Franciscans, by providing effective community-based programs that help prevent crime and turn lives around. In addition to his work as public defender, which he says was inspired by the unjust internment of his parents and grandparents during World War II, Adachi was the leading proponent of two controversial pension reform measures, Proposition B in 2010 and Proposition D in 2011. He also ran for mayor in 2011. • James Fang, a 24-year incumbent on the BART (Bay Area Rapid Transit) Board, lost to clean-energy entrepreneur Nick Josefowitz, 26,636 (42.51 percent) to 31,272 (49.91 percent). • San Francisco Assessor-Recorder Carmen Chu ran unopposed for re-election and received 113,094 votes (98.07 percent). • Katy Tang, who succeeded Chu on the San Francisco Board of Supervisors (District 4), was unopposed for re-election and received 11,353 votes (96.67 percent). • Supervisor Jane Kim had four challengers and finished first with 6,560 votes (67.28 percent). • Jean Quan, who four years ago became Oakland’s first Asian American mayor, was unseated by City Councilmember Libby Schaaf, 20,094 votes (29.07 percent) to 10,889 (15.75 percent. In third place was City Councilmember Rebecca Kaplan with 9,978 (14.4 percent). It was a crowded with race with 16 candidates. Quan was frequently criticized during her tenure over such issues as crime, jobs, and her handling of the Occupy Oakland protest, which was dispersed by police with tear gas and batons. She was also accused of causing an accident by talking on a cell phone while driving. 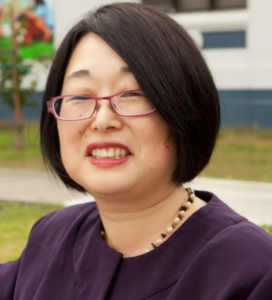 • Aimee Sueko Eng won the District 2 seat on the Oakland Unified School District Board of Education, receiving 6,168 votes (75.59) to William “Bo” Ghirardelli’s 1,963 (24.06 percent). Eng, who is senior program manager at the Thomas J. Long Foundation, succeeds three-term board member David Kakishiba. • Sue Wakamoto-Lee, a candidate for the Dublin City Council in Alameda County, finished in last place with 1,737 votes (16.31 percent). The winners were Vice Mayor Don Biddle and Councilmember Abe Gupta with 4,357 (40.92) and 4,508 (42.34), respectively. • Lance Nishihira, a candidate for the New Haven Unified School District Governing Board (Union City and Hayward), was in last place with 2,873 votes (20.01 percent). Incumbents Linda Cantas and Sarabjit Kaur Cheema were re-elected with 4,231 (29.47) and 3,732 (25.99), respectively, and Gwen Estes was third with 3,479 (24.23 percent). • Karri Jo Murayama, a former member of the Byron Union School District Board in Contra Costa County, finished in last place with 691 votes (15.87 percent). The winners were incumbent Jill Sprenkel with 1,034 (23.75 percent), Diane Stewart with 906 votes (20.81 percent) and former board member Tania Salinas with 873 (20.06 percent). Also running was former board member Felicia Schweller, who was fourth with 825 votes (18.5 percent). The current board includes Jeffry Sugimoto, whose term expires Dec. 1. • In the Brisbane Elementary School District (San Mateo County), Parks and Recreation Commissioner Karen Akiko Lentz was the top vote-getter with 906 (31.1 percent). Also elected were Roxana Hui with 862 (29.6 percent) and incumbent Leonel Tingin with 774 (26.6 percent). Real estate agent Joel Diaz was a distant fourth. Lentz is also a board member of Brisbane Dance Workshop and co-owner of Silverspot Graphics. • Mountain View City Councilmember Margaret Abe-Koga lost in her bid to become a director of the El Camino Healthcare District, receiving 12,899 votes (28.45 percent). The winners were vascular neurologist Peter Fung with 16,428 (36.23 percent) and incumbent David Reeder with 16,017 (35.32 percent). Since joining the City Council in 2007, Abe-Koga has served as vice mayor in 2008 and mayor in 2009. She was the first Asian American woman to lead the city. • Running for a seat on the Mountain View City Council was Ellen Kamei, who finished sixth out of nine candidates with 2,829 votes (10.29 percent). The winners were civil engineer Pat Showalter with 4,600 (16.73 percent), family financial planner Ken Rosenberg with 4,123 (14.99 percent) and environmental oversight executive Leonard Siegel with 3,757 (13.66 percent). Kamei is a policy aide to Santa Clara County Supervisor Joe Simitian and vice chair of the Mountain View Environmental Planning Commission. • In a 12-way race for five seats on the Palo Alto City Council, independent contractor Lydia Kou just missed making the cut, finishing in sixth place with 7,799 votes (10.71 percent). The winners were incumbents Karen Holman and Greg Scharff, high-tech entrepreneur Tom Dubois, semiconductor executive Eric Filseth and Cory Wolbach, district staff member for State Sen. Jerry Hill. • Incumbent Cupertino City Councilmember Barry Chang was re-elected with 5,444 votes (15.68 percent). Also elected were De Anza College Commissioner Savita Vaidhyanathan with 5,336 (15.37 percent) and Cupertino Parks and Recreation Commission Chair Darcy Paul with 5,317 (15.32 percent). Among the unsuccessful candidates, Public Safety Commission Chair Andy Huang was fourth with 5,148 (14.83 percent) and former Planning Commission Chair Don Sun was eighth and last with 2,623 (7.56 percent). • In San Jose, Assemblymember Paul Fong (D-Cupertino) lost to high-tech manager Charles “Chappie” Jones in the District 1 race for San Jose City Council, 5,550 votes (40.32 percent) to 8,215 (59.68 percent). Fong has served in the Assembly since 2008 and is termed out. • In San Jose’s District 7, attorney Tam Nguyen was elected to the council with 6,570 votes (51.05 percent) to Franklin-McKinley School District Governing Board member May Esparza’s 6,300 (48.95 percent). • In the City of Santa Clara, Kevin Park, scientist, engineer, teacher and chair of the Santa Clara Citizens Advisory Committee, fell short in his bid for the City Council, losing to former Councilmember Dominic Caserta, 6,797 votes (35.10 percent) to 7,593 (39.21 percent). Retired businesswoman Roseann Alderete Lacoursiere finished third. • Saratoga Mayor Emily Lo was re-elected to the City Council with 6,229 votes (25.11 percent). Also elected were Planning Commission Chair Mary-Lynne (Pierce) Bernald with 5,529 (22.29 percent) and former Planning Commissioner Rishi Kumar with 4,808 (19.3 percent). Also in the running were former Planning Commissioner Yan Zhao (4,735, 19.09 percent) and data center engineer John Chen (3,505, 14.13 percent). • Psychiatric technician and PTA member Sachiko Konatsu was last out of four candidates in the Natoma Unified School District with 1,303 votes (10.53 percent). The winners were incumbents Lisa Kaplan and Teri Burns with 4,425 (35.74 percent) and 4,070 (32.88 percent), respectively. Civil engineer Jag Gains was third with 2,533 (20.46 percent). Konatsu said that her father, who was interned during World War II, taught her to treat everyone fairly regardless of their background.